The most recent overnight attack on a guesthouse in Kabul resulted in only four Taliban casualties. Miraculously, only the four attackers were reported to have been killed in the standoff which lasted six hours. 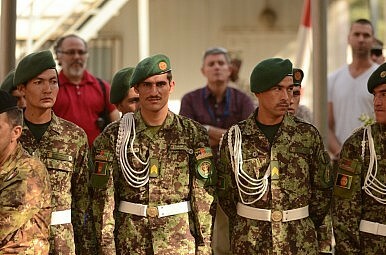 According to TOLOnews the guesthouse’s security, “along with special forces managed to prevent the insurgents from storming the hotel – despite one attacker detonating his suicide vest in order for them to gain entry.” The interior ministry says the attackers were armed with a rocket-propelled grenade launcher and assault rifles. A lot has been said in the past few months regarding the capability of Afghan forces to adequately provide security in the country and a series of high-profile attacks in Kabul seem to be serve as testament to the deteriorating security situation. But, as Franz-Stefan Gady noted in late April, the fighting season has begun with a vengeance. By summer’s end, we’ll have a better assessment of what the Afghan security forces can handle on their own. Tuesday’s guesthouse success may be overshadowed by the generally worsening security situation in Kabul and around the country. Earlier on Tuesday, three checkpoints were seized by Taliban in Helmand Province and at least 20 security and police officers were killed. Fighting was reported in southern Kandahar and in Wardak, in the east, four suicide bombers attacked a local court. Earlier this month, a Taliban gunman walked into the Park Place Hotel in Kabul, where mixed group of Afghans and foreigners were attending a classical Afghan music concert, and began shooting. Fourteen were killed in that attack. Afghan officials are well aware of the security situation in their country, and their pique at repeated reports of the under-preparedness of the Afghan security forces is beginning to show. Sediq Seddiqi, the interior ministry spokesman, alluded to the worsening situation in Iraq (a comparison Afghans know all too well) and U.S. Secretary of Defense Ash Carter’s recent comment that “Iraqi forces just showed no will to fight” when ISIS moved into Ramadi. “We accept that we have challenges, but we know how to deal with it, it is not Iraq, we fight back with full force,” Seddiqi said. The gathering of about 2,000 Muslim scholars and clerics had endorsed a fatwa against the war, calling suicide bombings a sin. The Taliban’s Mixed Message Confuses the Peace ProcessThe Taliban’s Delusion Hampers ReconciliationWhy the Afghan Taliban Are Ready to TalkThe ‘Father of the Taliban’ Is Dead. What Does That Mean for the Afghan Peace Process?Why Does Pakistan’s Release of a Key Taliban Leader Matter?